Looking for something new to try for Super Bowl Sunday? Here is a wonderfully versatile Cheddar Cheese spread that is awesome as a dip, spread on cocktail rye and broiled, on a burger, or as a grilled cheese sandwich…. This spread/condiment will last in your fridge for a good couple of weeks, so put your creative mind to work!! 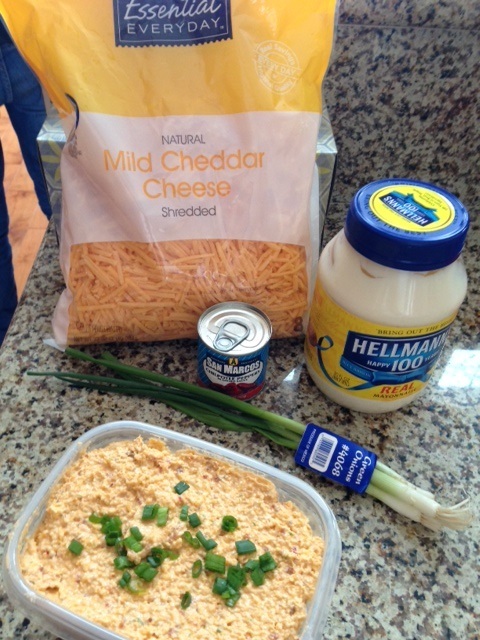 It’s kind of like a pimiento cheese spread with chipotles instead of pimientos! Very easy to make and you will LOVE it!! Put first 3 ingredients in bowl of food processor and process until smooth. Add canned chipotles and sauce. Process until smooth. Refrigerate for 2 hours to allow flavors to blend. Serve with tortilla chips or crackers. 4 alarm – add entire can with all of the sauce, plus one fresh chopped jalapeno. Put however many chipotles you want in the cheese mixture, give the processor a whirl, AND TASTE. **Remember, as the flavors blend in the fridge, it will get a bit “warmer” than when you initially taste it, so adjust. You can always add more later if it isn’t spicy enough for you! My sis sent this recipe recently. Sounds like a great snack for New Year’s Eve parties and football!! I wanted to pass this recipe on — something for the guys. I tried this recipe for Jerry’s fishing trip last fall, and it was requested for Thanksgiving by the guys. They have become a new family favorite. I always double the recipe when taking them somewhere. It’s really NOT too many!! If you make these once, you’ll see why I recommend doubling this recipe. Great snack!! Mix salad dressing mix, vegetable oil, dill and garlic powder in a large bowl. Stir in pretzels to coat well. Pour onto an ungreased cookie sheet. Bake at 200 degrees for 1 hour, stirring every 15 minutes.